I'm always looking for a great way to not only grow my herbs, but display them, too! 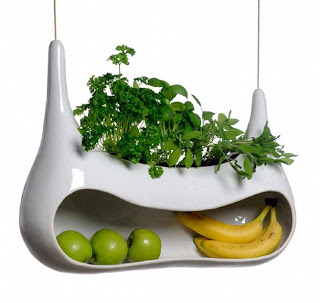 This is a great concept design for a modern herb garden to hang in your kitchen. It is called the Cocoon. Hang by a window, over your sink, wherever you'd like! Also, store your fruits in the little space underneath--how clever! Munchkin Grip-N-Sip Juice Box Holder--No More Messy Juice Boxes! Fred Boost Booster Seat--The Look of a Phone Book with Better Functionality! Qis Design Crystal LED Light: Amazingly Imaginative Nightlight for Kids AND Adults! Constructive Eating: Fun Tableware for Kids! Acme Writing Tools Crayon Pen--Your Kids Will Think You're Pretty Darn Cool! Boon Otto Animal Bag: The Solution to Stuffed Animal Storage!